PoNY and Truck Stop are two of the hottest teams in the division. Ultiworld’s coverage of the Men’s Division at the 2018 Club Championships is presented by Spin Ultimate; all opinions are those of the authors. Please support the brands that make Ultiworld possible and shop at Spin Ultimate! Pool C features two of the hottest teams in the country looking to forge a path deep into the bracket and two programs for whom success at Nationals would be a nice bonus to an already positive season. While Truck Stop and PoNY will likely decide who takes the pool, the ascendant Rhino Slam! will be looking to show that the rebranded and reconstituted Portland squad belongs back at the adult table and a rebuilding Johnny Bravo will try to show that the name on front of the jersey matters more than the one of the back of it. And all of a sudden, this is PoNY’s year. While #1 New York PoNY’s moderate success in recent years indicated gradual progress — they reached the quarterfinals at Nationals last season for the first time in the team’s history — their growth curve has accelerated. The team’s recent credibility and the pull of New York City have made PoNY an attractive free agent destination. With last year’s core now surrounded by the Pacific Rim battle exoskeleton of Jimmy Mickle, Beau Kittredge, and the rest of the offseason pickups, PoNY has become the hottest team in ultimate. With a winning streak dating back to August 4th that now stretches to 14 games, PoNY would likely be the no. 1 overall seed absent a false start to their season at Colorado Cup with the team’s two best players a continent away. 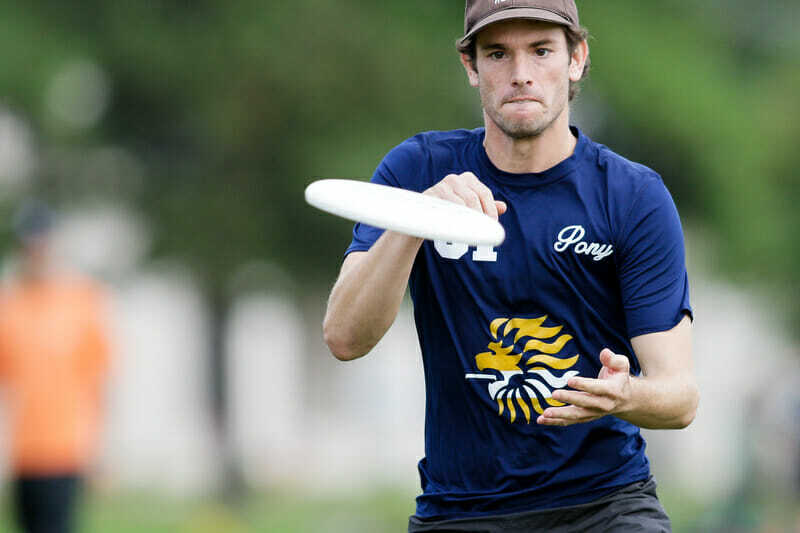 Since Mickle and Chris Kocher have come into the fold at the U.S. Open, PoNY have been the best team in the country and have only gotten better as they picked up Empire players Kittredge and Ben Jagt at the end of the AUDL season. You can feel the team accelerating as the season has progressed, and if they continue to improve at this pace, PoNY might not only win Nationals but really blow teams out of the water. So what could cool PoNY off? Their most noticeable issue has been D-line conversion rates, and at Nationals, you don’t get as many chances to put in your breaks. Of course, adding Kittredge to the D-line could go a long way towards shoring that weak spot up, as even in the twilight of his career, he creates space all over the field that gives an offense some breathing room. Speaking of offense, a lack of depth at the handler position could derail New York at an inopportune time. There are few players that you can point on PoNY’s that are “true handlers.” This may not be a problem, and perhaps the notion of “true handlers” will go the way of “true centers” in basketball, but for a team that is so talented, there is a lot riding on the shoulders of some less experienced players like Harper Garvey. This all amounts to picking nits, though, and PoNY has their best shot ever at winning a title this season. But championship windows can close just as easily as they open, and who knows if PoNY will have the same opportunity next year. We’ll see if they can take advantage of the moment. Perhaps the only team that is peaking as dramatically as PoNY right now is #4 Washington DC Truck Stop. A dismal start at Colorado Cup is now a distant memory after an impressive Pro Champs followed by a masterclass at Mid-Atlantic Regionals. Truck clobbered a supposedly competitive region, putting up the kind of stats you would expect if they had showed up to college Regionals. Their O-line went unbroken the entire tournament. No team put up more than six points on them in a game. They only surrendered a total of 15 points in the entire tournament. Eye-popping stuff. Coach Daryl Stanley (and his binoculars) deserves a lot of credit for getting Truck Stop into the position it is today, as the team has coalesced around some key on-field principles and a whole lot of confidence. While PoNY rode the buzz of big names to the top, Truck Stop lost two of its best players from last season yet finds themselves right back in the mix. Truck employs a uniquely physical brand of small ball. While goalty or mini influenced offense is usually associated with smaller, wispier teams, Truck Stop has size and strength across the board and uses it to bully-ball their way down the field. Size is, of course, prized in the deep game, but Truck often uses it to create space around the disc and, with technicians like Rowan McDonnell able to combine physicality with creativity, it’s hard for opposing defenses to dictate the terms of engagement to Truck’s offense. That physicality translates to defense for Truck’s O-line, and their after-the-turn defense has been exemplary. In the wind and rain at Regionals, they went break free not because their offense was perfect, but because the tenacity of their team in getting the disc back stopped anyone from taking advantage of their slip-ups. Truck doesn’t have the same sheer talent that the other top teams at Nationals possess. They will be hoping that the whole is greater than the sum of their parts. For the past few months, it has been. After a two year absence #12 Portland Rhino Slam! is back at Nationals. But the more things change for the club, the more things stay the same. The rebranding and some fresh faces from Oregon Ego have given the team a new look and new energy. But, on paper, the team looks similar to Rhino squads of old. Much like some older Rhino teams, most of the names that jump out at you on the roster found plenty of success in college, as top level club experience is a little harder to find. And it’s somewhat rote at this point to say that a team from Oregon has a tremendous offense and an anemic defense, but here we are. So if Rhino looks familiar on paper, what has the team looked like on the field? The defense couldn’t get it done at Regionals against the best competition, failing to upset either Furious or Sockeye’s rhythm and make the game truly close. In the game to go against Voodoo, they only broke the plucky Seattle squad once, to win the game 13-11. Of course, if you’re winning games with only a single break, it means the offense is pretty fantastic. Adam Rees has picked up right where he left off after his great college season and the return of veterans like Trevor Smith has given the team’s youthful energy some structure. The holes to poke are there for Portland. They haven’t beaten a Nationals team at a major tournament since early July and the defense is suspect. Despite that, the strength of this collection of young talent is formidable as well. Whether Nationals marks a new era in Portland ultimate or more of the same is still to be seen. This isn’t your grandpa’s #16 Denver Johnny Bravo. The Denver outfit hasn’t been seeded as low as #15 all decade, and without the Pro Champs heroics of (former Bravo star) Jimmy Mickle and PoNY sliding a second bid to the South Central, their near-two decades long Nationals streak could well have ended. It’s not just the results; it’s the names. Bravo lost 15 returners from last season, several of whom had been an important part of the team’s core for many seasons. Johnny Bravo this season brings to mind the Ship of Theseus — if you take away all of a team’s pieces and replace them one by one, is it still the same team? Luckily for Bravo, they haven’t lost all of their key players and roster turnover has given Ben Lohre and Henry Konker the chance to make the team their own. Getting veteran handler Owen Westbrook back midseason has helped, as his experience in coach Jim Schoettler’s offense will help stabilize the transition. The fresh blood on Bravo’s D-line has had tantalizing moments throughout the season where they make the team look like it has real fangs. A 4-0 run in the Regional final against Doublewide to tie the score late in the game showed both the talent and belief that the young players on the team have. They will need it against a brutally tough top of the pool. After losing 15 players, getting back to Nationals shows the strength of Bravo’s program. Upending some semifinals hopefuls in the bracket would show the strength of this year’s team. Comments on "Club Championships 2018: Pool C Preview (Men’s)"